OK, so last week Craig Ball reported on a third year law student who asked him what was the minimum amount of e-discovery information he needed to learn in order to get by. And I’m willing to cut a third year law student a little slack because…well, actually, no I’m not and I’m glad Craig held him out for public scorn in his column, I would have published his name. And the champagne corks pop at the electronic discovery support vendors’ boardrooms. Ditto to AndytheLawyer. Lawyers have ethical obligations to clients, not to Judges who understandably *want* all potential evidence perfectly preserved. But she never had to manage ediscovery or do so without the power of the government to force people to pay ***ungodly sums of money*** to properly preserve any potentially relevant information. When Judge SS says she’ll write the check for the capture and processing costs—gee, no one ever mentions that in an opinion—then I’ll be impressed. I wonder if a federal judge can afford to shell out $250k in preservation or processing costs for each ordinary case that lands in her court. The ediscovery vendors must be making offers to the banks to buy their private jets off of them. Okay, listen up knuckleheads. You don’t have to pay “ungodly sums of money” to properly preserve evidence. It’s called a document retention policy and if done properly and in a timely manner costs a modest amount and has an enormous ROI. Oh, yeah, and it gets done BEFORE the litigation is filed not after. Way, way before. The amounts Judge Scheindlin is talking about are called “sanctions”. Look it up JustALawyer. You’ll need to know the term if you ever get in front of one of those judges and spout this nonsense. ED vendors and corporate jets? I know a lot of the former and haven’t seen any of the latter. Mostly I find vendors want to work with smart clients which may explain your lack of exposure to them. Ignorant comments like these are what fuel, well ignorance. And like most ignorant people, when they don’t know what to do or when to do it, they blame judges and vendors and opponents … everyone but themselves. And oh by the way, you have ethical obligations to clients AND the court. Might want to look that one up also JAL. But be sure your malpractice premium is paid up first. I’m guessing you’re gonna need it. Many of the tools aimed at assisting with legal holds are less than three years old – hardly the sign of a mature, developed and stable market. Well the same could be said about police departments the day after the Miranda decision … altho the FBI by that time had already developed its own Miranda-like statement that they read to suspects being arrested. Some people see the writing on the wall, some people don’t. Changing to meet judicially imposed standards is what we do, even if it’s difficult or unpleasant. Really, if you boil the decision down to it’s basic requirements, what Judge Scheindlin says is you must send written legal holds to identified individuals and take ongoing and proactive steps to ensure compliance by those people. Is that really all that onerous? In fact. most IT staff I speak with say then easily do that … if they are asked to do it. So once again we circle back to education … perhaps the process isn’t being undertaken not because it’s incredibly difficult but because the attorneys don’t know the right questions to ask. After all, as Judge Scheindlin points out, all that is necessary to meet the stanadard is a reasonable, good faith effort. So let’s take a look at the requirements for a litigation hold and where they came from. First, let’s keep in mind that the obligation to preserve evidence began well before the ED rule changes in 2006. First, as Judge Scheindlin points out in Pension Committee, “The common law duty to preserve evidence relevant to litigation is well recognized.” And Judge Scheindlin herself set the modern standard for litigation holds two years before the rule changes. In Zubulake V, issued in 2004, she specifically held that counsel MUST issue a litigation hold when litigation either commences or is reasonably anticipated and further that the hold must be communicated clearly to key players who have relevant information under their control and that those players should be periodically reminded of the preservation duty. Although the 2006 rule amendments did not codify this position, it was endorsed in a 2007 Sedona Conference commentary, has been cited in numerous court decisions, both state and federal (cf, Synventure v Husky, 2009 U.S. District Lexis 105306 (D. Vt. Mar. 13, 2009)) and is being incorporated by the most recent state rule changes, notably the California Electronic Discovery Act of 2009. And now Judge Scheindlin has returned to the issue with her ruling in Pension Committee. And she makes it quite clear. The duty to preserve is a duty, not a choice. The failure to adequately preserve documents will cause spoliation and that equals gross negligence. The failure to issue a written litigation hold equals gross negligence. The failure to suspend routine document retention and/or destruction policies as part of a litigation hold will equal gross negligence. Failure to take these steps may result in sanctions including the allowing of further discovery, cost shifting, fines, special jury instructions, preclusion of evidence and default judgement or dismissal. I strongly urge all attorneys and their corporate clients to read the Pension Committee decision and familiarize yourself with it’s findings. They are not just suggestions, they are requirements. Here’s my two main impressions after looking back at the Legal Tech event this year. The first is the obvious trend my hosting companies toa dd more features which can distinguish them from the competition. Analytic tools, intelligent search engines, easier folder setups, better user interfaces, partnerships with other service companies: all of this tells me that hosting has finally been accepted and now the challenge is to provide more than simple “electronic Iron Mountain” basic storage. Service will be king in the hosting arena this year and watch for even more competitive pricing as the demand for these services increases throughout the year. I also expect to see more integration with cloud based case management systems and more intelligent search engines, in a manner consistent with the new search protocols we saw at the show from West and Lexis. And along the lines of product differentiation, I also expect to see more independent analysis of software products. Sean Doherty of Law.com mentioned in his column LegalTech New York: Thats’ A Wrap, that Legal Relay is a product to watch. This online forum for reviewing and rating software and services is based on on user-generated content although vendors can pay a premium to post product information. This combination will make LegalRelay the “Amazon reviews for legal technology,” says president and founder John Gilman. The second trend I saw in e-discovery was the increasing appearance of the flat-rate per document pricing model. I has seen this approach last year in several project bids and it was usually a thinly disguised attempt by major vendors to low ball or even give away collection and processing in order to land the hosting and review of a project. But now smaller vendors are embracing the concept and I saw at least four companies at Legal Tech offer this price model. My major concern here is that if the document population changes radically during the project and the vendor finds itself in a position of having underbid the cost based on that shift, there will be a push to get documents reviewed quickly and not necessarily accurately in order to maintain an acceptable profit margin. Now this can be handled by specific price structuring that provides for floating costs based on regular project reviews of the document population but I am still somewhat troubled by attempts to “guesstimate” document levels at the beginning of a project. Still, what is clear is that more competitive pricing, not just in levels of pricing but types of pricing, is here to stay as vendors move to compete much more aggressively for available work. And this can only be good news for firms and legal departments as they work on litigation budgets. Crowds at LegalTech were still heavy on day three. Excellent educational content was driving heavy attendance at the sessions .. I arrived five minutes late for a panel featuring Craig Ball, George SOcha and Ralph Losey and couldn’t even get into the room as it was beyond SRO into WRO, Waiting Room Only. Browning Marean and I were once again in the ED Zone, interviewing Atty. Maura Grossman from Wachtell about litigation holds and the new decision from Judge Sheindlin in the Pension Committee case. The TechLaw Solutions booth was buzzing with onlookers as the three of us discussed lit hold implementation, document collections in foreign countries and all things ED. Litigation hold applications were in abundance as were several new inexpensive forensic collection tools and a variety of analytic tools for early case assessment. And attendees strolling the exhibit hall could meet and chat with ED luminaries such as Craig Ball, Michael Arkfeld, George Socha, Judge Ronald Hedges, Mary Mack and even the seldom seen Bill Speros. Also spotted were document assembly pioneer Jim Eidleman and Roger Miller of El Paso, owner of Altep, one of the earliest lit support vendors in the country. And spotted all over the show floor was Monty Lunn of the Alchemy Group telling everyone about the first annual Green Legal Matters Symposium being held in New Orleans on April 27-28. The mood was decidely upbeat as attendees were optimistic about a gradual turnaround in the business climate. And of course today I had to wear my Saints jersey and give a shoutout to the Who Dat nation. One of the mysteries of the show, however, were the constant tweets from The Fake Tom O’Connor. Depsite numerous questions, I can assure you that it was NOT me tweeting under that name and the actual identity of TFTO is still unknown. I’ll recap the trends and issues of the show but right now I’m off to JFK to catch a flight home. I’m reporting live from the ALM Editors Breakfast at LegalTech New York. All the ALM journalists, editors, bloggers and writers in attendance are here introducing themselves and mingling with attendees. Some of the names you may recognize include Monica Bay, Craig Ball and Bob Ambriogi and I just had a most pleasant conversation with Gabe Acevedo and Mary Mack. I arrived in New York in time for the TechnoLawyer dinner Sunday evening. It was well attended and I saw many old friends including Yui from CaseLogistix. Monday morning I began a series of speaking engagements for the day and made only a brief visit to the exhibit hall but when I did the rooms were crowded and booths were filled with attendees. Monday evening was the LTN Awards dinner which saw Craig Ball receive the Consultant of the Year award and Tom Burke, founder of Worldox, receive a Lifetime Achievement Award. 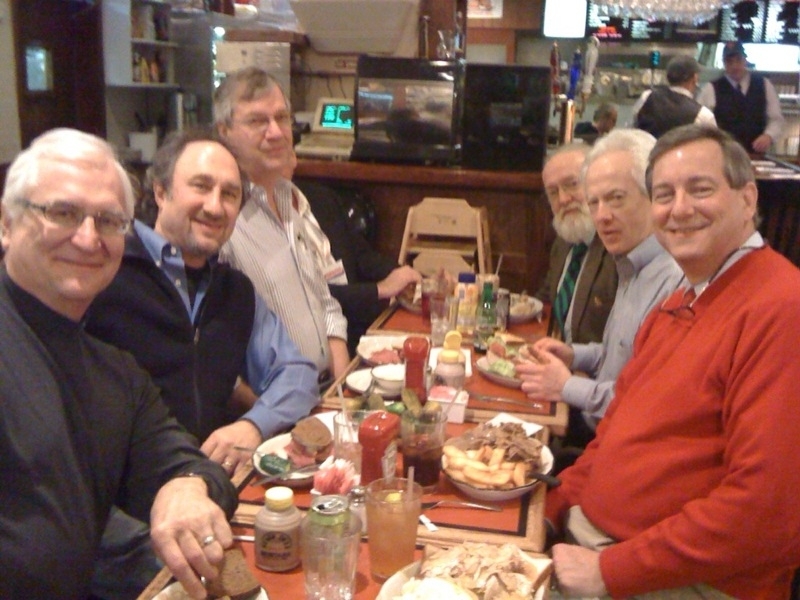 Legal luminaries such as Michael Arkfeld, Neil Aresty and Andy Adkins were in attendance and after the “dinner” many of us adjourned to the nearby Stage Deli for heaping amounts of pastrami and cheesecake. I’ll be in the exhibit hall most of the day today meeting with folks and talking to vendors so I’ll do a detailed report on that experience later today.